Bees are in trouble. Three of the 25 species of British bumblebee are already extinct and half of the remainder have shown serious declines, some up to 70%, since the 1970s. The reasons are complicated and not clearly understood. To make matters worse, bees have been hit hard by the current long-term drought. Bees are essential to a healthy economy as well as a healthy environment. Without bees and other pollinators, our diet would be dull and less healthy: imagine life without fruit and honey. Pollinating crops artificially would cost UK farmers £1.8 billion a year. Hackney Council is already taking some positive steps towards becoming a more bee-friendly borough. The hairy-footed flower bee is a target species in the recently published Hackney Biodiversity Action plan, as is honeysuckle, a shrub popular with bees. Target species are those important to the biodiversity of Hackney and are a priority under the plan. The plan includes measures that should help bees, including targets of 20% of grassland on social housing estates and 20% of grassland in parks and green spaces to be managed for biodiversity. It’s not just the council, though: there are things we can all do to help bees. Most Hackney residents don’t have gardens, but a window box or balcony with herbs such as rosemary, marjoram or chives, or with bee-friendly flowers can help. Bee-friendly flowers are those with single blooms, because they are easier for pollinators to get into than highly bred double flowers. A variety of flower shapes supports different species of pollinator and a succession of flowers on the same plant provides nectar over a longer period of time. If you do have a garden, you can help by not paving it over, and avoiding using chemical sprays. Another way to help is to buy British honey, as local as possible, for example from Stoke Newington Farmers’ Market. My garden is, I imagine, fairly typical of a Hackney garden: partly shaded by surrounding buildings and with heavy clay soil. Red dead nettle is often busy with bees and flowers pretty much continuously from early spring to autumn. Through the seasons, bee-attracting flowers that grow well include: pulmonaria, forget-me-nots and honesty in spring; comfrey, honeysuckle, buddleia, fuchsia and single-flowered roses in summer; and Michaelmas daisies and sedums in autumn. Bees make much use of the bird bath: they need water too. If you want to go a step further than planting, you could join our campaign to help save the bee. Hackney & Tower Hamlets Friends of the Earth are among 200 local Friends of the Earth groups across the country that are signing up to the Bee Cause. The aim of the campaign is to get the government to adopt a national Bee Action Plan. 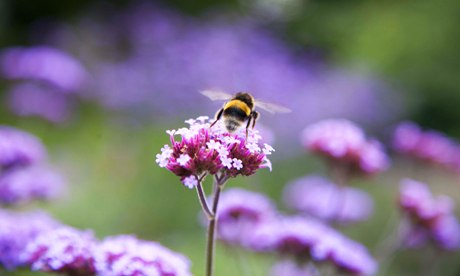 To create a buzz around this, local groups will be creating local Bee Action Plans, a set of actions that we hope Hackney Council and local organisations and residents will sign up to, to make Hackney a more bee-friendly place. Along the way, we’ll be organising fun, bee-related events, such our bee walk in and around Victoria and Mile End Parks on Sunday 8 July. If you’re already working to help bees, or you’d be interested in helping to draft a local Bee Action Plan, please contact Katherine Pitt on katherine_pitt2005@yahoo.co.uk. For more information about the Bee Cause go here. Real news stories don't come cheap. The Hackney Citizen is the borough’s only independent newspaper, and is now in its tenth year. Our hard-hitting journalism has uncovered fire safety failures in tower blocks, revealed plans to criminalise rough sleepers, exposed dodgy letting agents and reported on many other issues of public concern. We’ve always been totally free in print and online, but advertising revenues are falling. That’s why we’re asking for your help. Hackney Citizen’s high quality journalism is produced by a small team on a shoestring budget, so we’re asking you to make a monthly contribution to fund our work, enabling the paper to survive and thrive. Support the Hackney Citizen from as little as £2 per month. Hackney Citizen does not take responsibility for any comments posted on this site. Hackney Citizen is operated by Citizen Media Limited - Terms and Conditions. Citizen Media Ltd Registered in England and Wales. No. 06948834. Registered Office: Citizen Media Limited, SPACE, 129 -131 Mare Street, London, E8 3RH. The Hackney Citizen® is a registered trademark © 2018 Citizen Media Limited.